Over the past decade hundreds of fourth grade students who live in large cities near Death Valley have gotten the chance to make an overnight trip to Death Valley National Park, where they learn about the unique landscape, conduct science experiments, and get the chance to see a truly dark sky and breathtaking stargazing. These students have been able to do so through the Death Valley R.O.C.K.S. 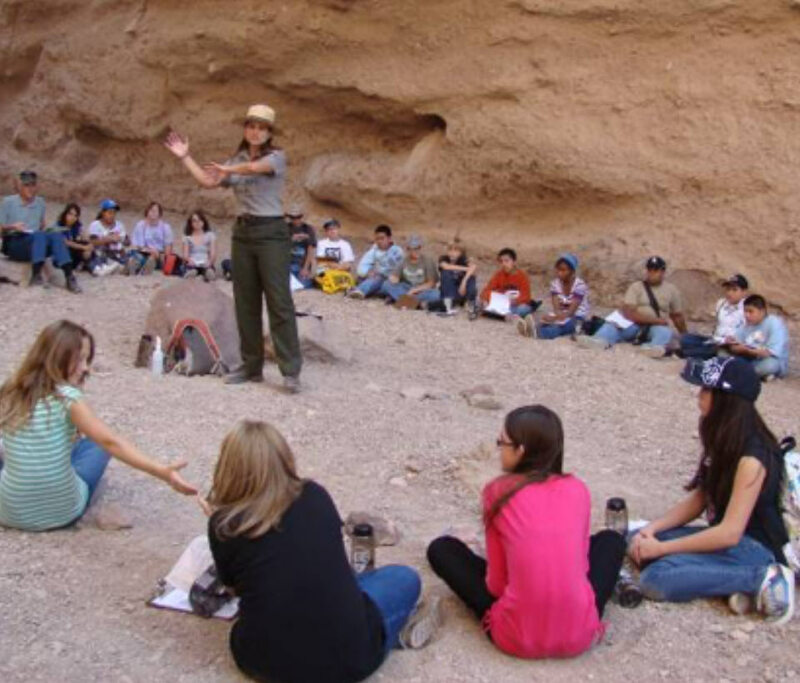 (Recreation and Outdoors Campaign for Kids through Study) program, led by National Park Service rangers, who guide these young, curious minds as they hike, learn, and experience the outdoors. For many of them, it’s the first chance they’ve ever had to go camping. Park Rangers provide interpretation to students. Students camp under the stars in Death Valley. 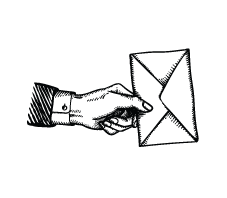 Science experiments are part of the R.O.C.K.S. curriculum. 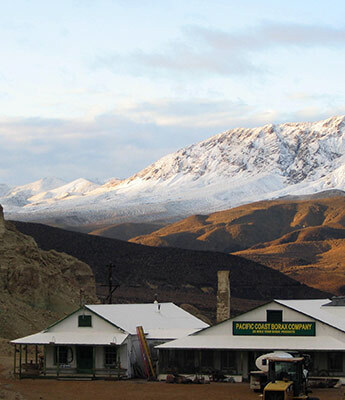 In its role as a supporting nonprofit organization for the park, the DVC helped rally financial support for the school trips, which are co-sponsored by the National Park Service and the Death Valley Natural History Association. For example, thanks to the DVC’s help in creating a partnership, for several years Coleman Company provided a stipend to help defray costs for student transportation to the park as well as hundreds of sleeping bags that kids not only got to use on their camping trip, but then got to keep and take home with them afterward. There is always a need for more financial support for these trips, which create lasting impacts. 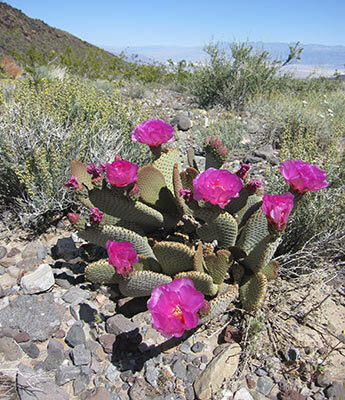 On top of exposing the next generation to the wonders of public lands, DVC hopes that each Death Valley R.O.C.K.S. experience sparks in each child a lasting passion for the outdoors. 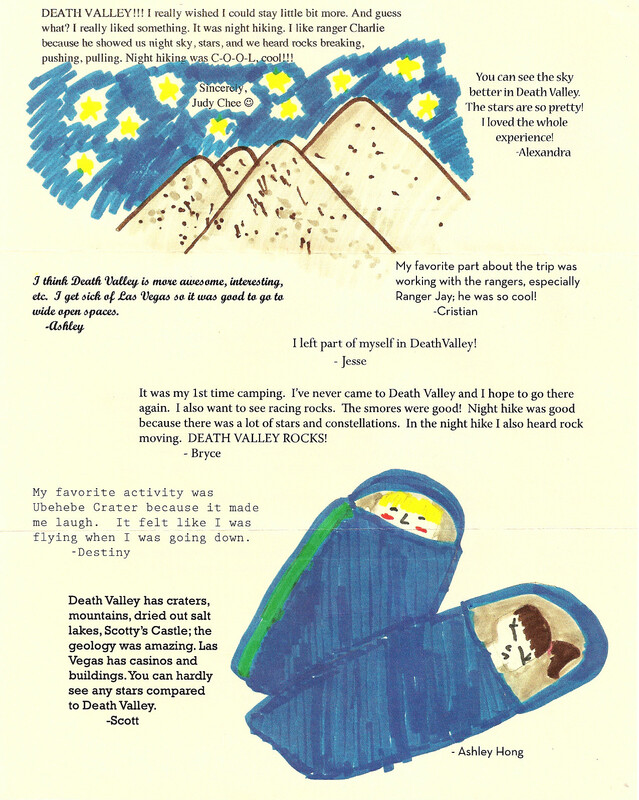 Students write and draw about their experiences with the Death Valley R.O.C.K.S. Program. 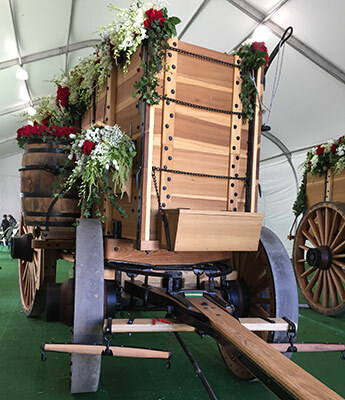 Thank you generous donors for making these exciting projects possible.